The products available for you roofing needs from Big Horn Roofing include EPDM membranes, TPO (thermoplastic polyolefin), PVC, Hypalon, SBS & APP modified bitumen, and elastomeric coatings. EPDM (ethylene propylene diene monomers) is classified as a thermoset material which means that it is either fully-cured prior to being installed or that it cures during natural weathering after installation. EPDM roofs are single-ply membranes meaning there is only one ply of roofing material, not multiple plys laminated together. EPDM has been used on roofs in the USA since the 1960's and is one of the most common types of low-slope roofing materials. This is because it is relatively inexpensive, simple to install, and fairly clean to with compared to the conventional built-up roofs. There are no odors and fumes that accompany built-up roofs which appeals to many property owners and managers. Big Horn Roofing's manufacturers providing EPDM are Firestone Building Products and GenFlex Roofing Systems. TPO (thermoplastic polyolefin) membranes are marketed as a product that combines the properties of EPDM and PVC without the associated drawbacks that the latter two materials have. In other words, they are supposed to be as UV resistant and as heat resistant as EPDM and as heat-weldable as PVC. The benefits and characteristics of TPO are (1) it is environmentally friendly and recyclable (2) seams can be heat welded (3) available in colors (4) resistant to heat and UV degradation (5) resistant to many chemicals (6) good cold weather flexibility (7) no external plasticizers added. Big Horn Roofing's manufacturers providing TPO are Firestone Building Products , GenFlex Roofing Systems , Stevens Roofing Systems , and Burkeline Roofing Systems . PVC (polyvinylchloride) is one of the fire-safest roof materials. Joining is made by heat welding with the help of special welding machines. High puncture resistance (the membrane is reinforced with polyester net). PVC membranes are very popular in Western Europe and in the United States. PVC membranes are designed for durability and are able to withstand extreme environmental exposure. PVC can provide the right solution for your project regardless of configuration, usage, slope, height, location, or wind exposure. Big Horn Roofing's manufacturers providing PVC are Firestone Building Products , GenFlex Roofing Systems , FiberTite Roofing Systems , Stevens Roofing Systems , and Burkeline Roofing Systems . Hypalon membrane is a reinforced, heat weldable membrane based on DuPont-Dow Hypalon, chlorosulfonated polyethylene (CSPE) synthetic rubber. Hypalon is thermoplastic in nature which allows it to be heat welded. After installation and exposure to the elements, Hypalon cures into a crossed linked rubber. Once cured to its ultimate strength, Hypalon shows little change to extensibility and tensile strength. 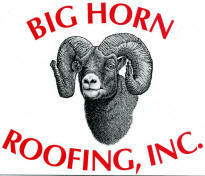 Big Horn Roofing's manufacturers providing Hypalon are in Stevens Roofing Systems , and Burkeline Roofing Systems . Modified Bitumen membranes are available in SBS (styrene-butadiene-styrene) and APP (atactic polypropylene) APP membranes are applied using a torch. The back of the sheet has extra asphalt on in which, when heated, bonds to the substrate. This is especially convenient for the smaller, more cut up roofs because less room and equipment is needed on site to torch-apply the membrane. SBS membranes are a highly durable elastomeric blend with exceptional elongation/recovery properties over a wide range of temperatures. They can be hot asphalt applied, torch applied, or cold adhesive applied. Roofing's manufacturers providing modified bitumen membranes are Firestone Building Products , and Siplast/Ipocal . Elastomeric Coating is a tough polyurethane coating that combines the highest physical properties to provide maximum protection for existing membrane roofs, metal roofs, and concrete surfaces. Coatings are formulated to resist rooftop traffic, hail, ultraviolet light, chemicals, and ponding water. Big Horn Roofing manufacturer providing elastomeric coating is Neogard .